Don't the shuttles become expensive scrap metal after this trip is done? Or do they exist for museum exhibits or spare parts/working lab for NASA staffers? I either heard or read that Discovery is heading for a museum and I think I heard or read the Smithsonian Institution may have the edge at being selected. I remember, I heard a special crew has been assembled (cheap pun) to prepare Discovery for delivery to a museum. Which meseum wasn't indicated. There is probably a press release on this. I'll see if I can find it. One more thing, after my previous post I was thinking that I should qualify something. Discovery is the oldest ship still operational. Others were built before Discovery, but tragedy has taken two of those away and I seem to recall one was rebuilt or was retired. That was for testing, but I better check on that. I may have that wrong. Was a few decades back when they started building these ships, so my memory needs refreshing. The last welcome home from Space. Having completed its final mission, officially designated STS-133, Discovery is now headed to retirement as NASA phases out the shuttle program. Discovery will likely end up as an exhibit at the Smithsonian National Air and Space Museum, but NASA will not make an official proclamation on the future home of the three remaining shuttles until April 12. Last landing! So much has happened since the first Discovery landing. But it's not her last mission. She now has the mission to awe -- The Wonder Wall -- then to educate. The "awe" will happen when some young person walks into the view of Discovery's static display area and that young person is so awed by what he/she sees that the mind starts wondering what that thing is and starts studying from right then and doesn't stop. That mission may last a very, very long time. That mission may very well have a longer lasting impact on the human journey to space than the one she just concluded. Some might state it should be written, "The human journey back into space." It could be stated that everything came from "space". Science will be cool again, they will also look at becoming a pilot to take the controls of the big bird. Young people are the future of space and their dreams will take us even further. I am a strong believer in my feet being on the ground. Not a dream of going up into space & YES like all of us I do remember the one shuttle coming back, with some small damages, at the start into space, & it, along with its crew simply disappeared into the air or whatever. I have been a mountain climber & at times that is taking a bit of a chance, but basically my feet are on the ground. Also admit I raced m/cs mainly in dirt comp events to some road racing, but while a gamble on staying alive, basically my feet have been on the ground to my way of thinking. The space shuttle Discovery - a veteran of thirty-nine space flights - awaits her voyage to the Smithsonian's Air & Space Museum near Washington, D.C. on Tuesday. Discovery is photographed on April 8 inside the massive Vehicle Assembly Building at the Kennedy Space Center by this aerospace reporter. She will be mated a top a modified NASA 747 aircraft and flown to the Steven F. Udvar-Hazy Center. 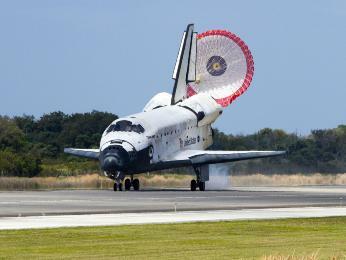 Discovery is NASA's most flown spacecraft and spent a combined 365 days in space during her 26 year storied career. An era comes to a graceful end. This will be a great way to get a new generation interested in space.